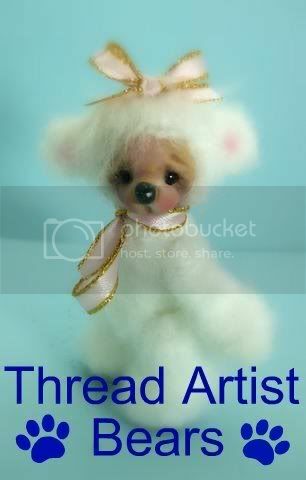 Threadanimals Moderator and Artist Extraordinaire!! 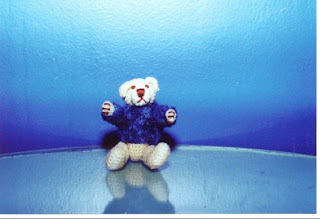 Written by fellow Mod Bobbie R.
Can you picture a young Mother, knitting and crocheting and sewing animals and dolls to entertain her children, because those are the inexpensive materials she had to work with, and being a young family, they could afford more playthings if Mom created them? And now this same 'Mother' creates similar bears, dolls and other animals and collectors from all around the world clamor to see what will next come from her needles and hooks, and competition awards are filling up the shelf and wall space in her home? This award-winning artist, who had the same beginnings that many of us did, is the internationally known designer and creator of ThReadTeDs®, Berta Hesen-Minten! Although her children, Krista and Bas, are grown and have put aside their playthings, the knowledge that Berta gained in engineering those early designs is part of what has lead to her amazing career in many of the Needle Art formats. Her family remains in her bear world however—they are there for compliments as well as the times to give 'constructive criticism!" While Berta is best known for her amazing crochet designs and patterns, she has spent much time during the past few years in learning the almost lost needle art named Oya Lace, which originates in Turkey. Searching for someone to teach her Oya had her traveling by train many times to the north in her native Netherlands, to Amsterdam, to "learn by doing". 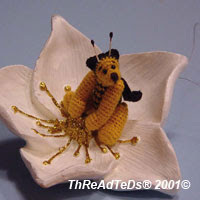 After much practice with a basic sewing needle and thread, Berta would ride north again and again for another lesson, until she eventually got to the point where she understood the basic principles and felt confident enough to begin to design her own flowers. 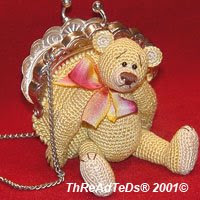 An d her very persistent hard work has paid off, as one of her most favorite bears, a N.O.S.T.© (New Old Style Ted) with a wonderful cascading collar of Oya flowers has just won the Swiss 2007 First Place Award and a TITA 2008 in Japan. The N.O.S.T. 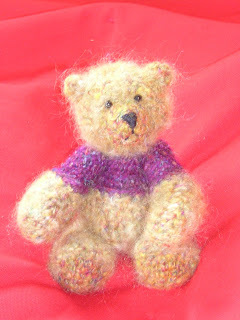 bear took over one year in development, just in getting the stitching and shaping to look like Berta pictured older teddies to look, but without a typical 'crochet stitch' surface. There were years in between the toy-making years for Krista and Bas, when Berta's skills were not producing these tiny treasures. 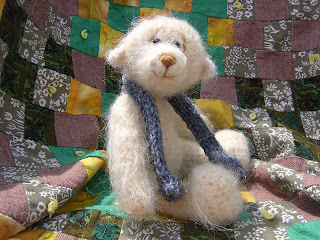 She was attending a bear show in the 90s with a friend and purchased a sewn teddy kit. That was the beginning, as it was for many of us. The possibilities were quickly realized and Berta's old toy-making skills came right back. "No, I don`t have my childhood bear, a big yellow bear with straw inside and a voice box. I remember taking out the voice box one day, because the voice box was not working correctly - - - - that`s why I am sure there was straw inside! When I left home I left him in the attic to perhaps pick him up later. 'Later' never came, and somehow, with cleaning out the attic, the bear disappeared. I regret I did not save him, along with other childhood things. 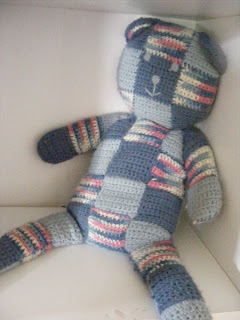 Maybe I should try to crochet him... We didn`t have that many toys, and those we had were low budget toys. Still, it would be nice to have them now. I had an elephant toy to play with. He actually was not mine, but was my oldest sister's (13 years older than me), who allowed me to play with him. When she left home she took the elephant with her." "I now need to create, to do something with my hands. I love all kinds of needlecraft, and since I discovered bearmaking, I can combine all my other needlecraft addictions with my bearmaking." "I am mostly self taught; I appreciate how in the past, designers wrote down the techniques of bearmaking. 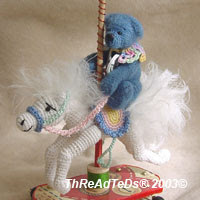 I learned so much from them: when I added thread bear making to my other bear making mediums, I received many requests for a pattern. 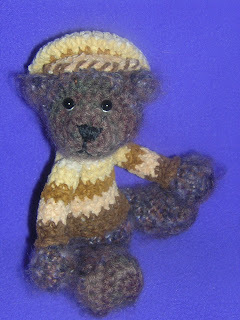 There were no patterns available for crocheted teddies, and as I was so happy to have been able to learn from others, I knew others would be happy to learn from me. It was my turn to write down my knowledge of thread bear making. 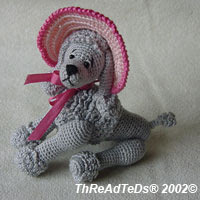 I was also able to add some of the knowledge learned from vintage crochet pattern books. 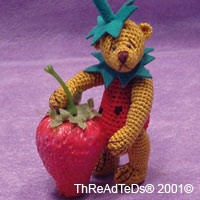 I love needle crafts from the past. These works are made with so much more detail than are done these days. 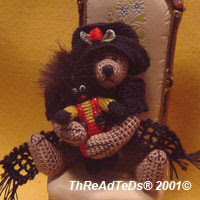 I try to add these fine details in clothing, collars and hats that my bears are wearing. The old information should never die out!" Since 1999, this has been a full-time job for Berta, and she approaches it as a business, portioning her time out to design, creating, travel, exhibiting, writing, teaching and even paperwork, though Bas and husband Leo and his computer help out with some of those too! Beginning with an idea sketched on paper or sample body part cut out of muslin for a sewn design, or crocheting a certain number of stitches and writing them down, Berta adjusts from these basic beginnings, pulling out stitches, beginning again, scratching out notes, writing down changes, pulling out stitches again... and again... and again. From these beginnings every different bear is created. Even a basic pattern that she developed in the past can look brand new with just a change in hook sizes and different yarns. First designs always take the longest, after that (and when the pattern is written so she can read it herself!) 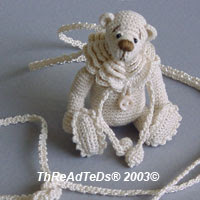 it takes approximately 7 hours to crochet the bare bear. But - many more hours are spent on the faces and the finishing. 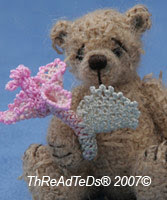 Berta does try to finish of the creating of all parts of one teddy at once, though the parts may stay in a small baggie waiting to be to be finished, "...until the time is right." And sometimes EVERYTHING is put on hold while another idea pops into her head and INSISTS on being made IMMEDIATELY! Those are often the best designs because they seem to come straight from the artist's heart. Berta is a perfectionist, which is why every pattern is meticulously written down: if one limb ends up with one extra stitch, instead of doing a decrease as most of us would, Berta pulls out the whole piece until she finds the mistake and crochets it again. 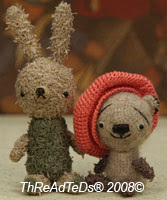 Even with the written patterns for each bear, most patterns become One-Of-A-Kind. 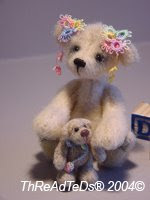 Berta is one of the artist types who would find it extremely difficult to fill an order for multiples of 10 or 100 of any one teddy! Even now, some may be 'similar' but each one will be different enough to have its own personality and character. A collector would have a difficulty identifying any matching patterns as each one just smiles and 'shines' on its own! 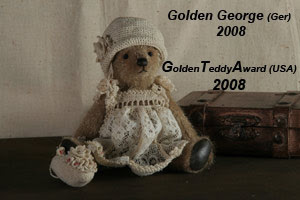 Over the years Berta's bears have evolved, as have most artists', as can be seen in the accompanying images. The first bears designed were basic bears as "It's good to become well-grounded in the basic skills: that is what you need to be able to build the more complicated designs on." "As I don`t like to do the same basic bear over and over and love to play with shapes, for the future I plan to continue making more N.O.S.T.© bears, but in different shapes and sizes. 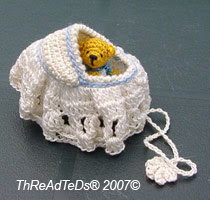 I'll also be adding old-fashioned, miniature, crocheted toys for them to hold, like my 'Cradle Me Bear', an idea born out the old-style children's' toy, mostly homemade in olden days by mothers for their kids to play with. 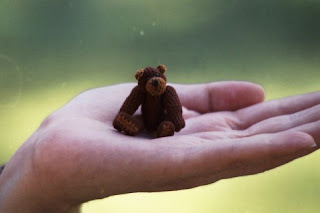 "I might make even larger-sized bears. 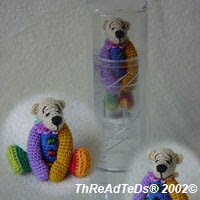 I recently designed two 10" bears and they became prize winners, which were both a joy and an honor to me." 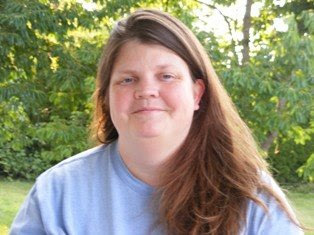 Berta is honored by all of the awards that have been bestowed on her work. The competitions that she feels are the most helpful are those from the Asian/Pacific Rim countries, where a point system of merits is tallied up and the judges also put down personal comments on both the good and bad points of the design and execution of that design. "That is the only way in which artist will learn, when a knowledgeable person in the same field of art can guide, by personalized written example. And it is always better to judge the work in person than from a photograph." One last thing that she is still hoping to achieve is a perfectly in-scale open mouth and opening/closing eyelids. These elude her right now due to the nature of crochet stitches and the bulk each creates. That is a goal worth working towards! 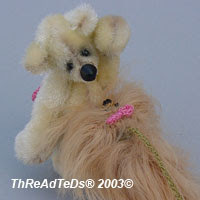 ThReAdTeDs© and Berta Hesen-Minten's work is currently available only at Teddy Bear shows in Europe (venues are listed on her website). Occasionally one of her pieces will pop up on her website and she hopes to be able to offer her work on eBay again soon. We are changing the focus of our Artist of the Month feature over September and October, with a new selection called Meet Your Mods. We know that you've seen our names and some of the work that we do behind the scenes to keep Thread Animals humming smoothly along. 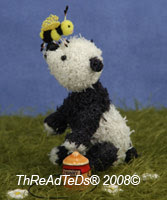 We're going to give you a little bit larger peek into our lives and our work here in Thread Animals. The natural First Choice is the person whose vision brought all of us together, Debbie Nicholas. Along the way, with past and present members numbering around 2000 individuals and countless projects finished (we won't even think about those UFOs tucked away in drawers!!) friendships made that bridge difficulties and oceans—Debbie is the person whose vision began it all. And, she almost fell into this by accident! Of course crocheting and knitting were two hand art skills she'd learned much earlier in life and at different times in our lives, we all envision these talents as possible outlets for bringing in possible extra income. 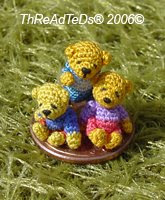 In surfing the internet, Debbie also browsed eBay® and found impossibly tiny, beautiful, miniaturized crocheted bears, made from threads and extremely fine yarns by Berta and a handful of other artists. The first ThReAdTeD I ever held, made by Berta from my pattern. She watched the auctions for months as she tried to figure out how these were designed. 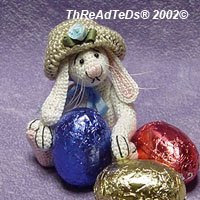 At that point Debbie designed her first pattern, sold it on eBay and the buyer aided her in setting up the yahoo® group which is our present Thread Animals! 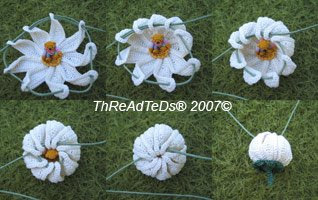 My first pattern sold on ebay. It didn't always flow this easily however, not just like A, B and C. Debbie once made a bear out of 'Granny Squares & Triangles', sewn together. As proof that it CAN be done. 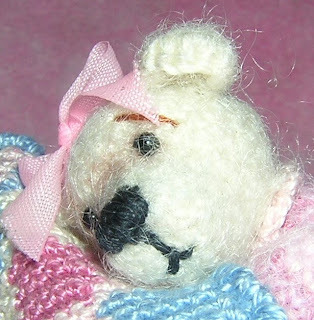 And being self-taught, the first few thread bears she designed were by adapting knitted instructions for a jointed bear into crochet, which turned out looking like a rat according to Debbie, a not-too-uncommon occurrence for bear makers working in all mediums! 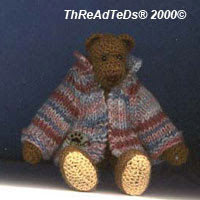 The bear labeled the 'Rat' bear, was modified and the pattern published but (Debbie feels fortunate that) the image of her original version wasn't photographed, as she felt it looked like like a 'rat'. My first published pattern. I added a removable sweater. The jointing was also troubling to understand on her own so she took a chance (on being rebuffed!) and wrote to Berta Hesen-Minten for help. Berta was most helpful and friendly, even though Debbie was not a client at that time. Once she actually held some artist miniature bears and possessed professionally produced patterns and the unique, only book of its kind: ThReAdTeDs: Secrets & Patterns"© 2004 Berta Hesen-Minten, many of the techniques fell into place in her mind. In the beginning Debbie felt lost without step-by-step instructions to follow. 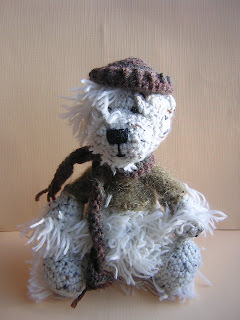 "I couldn’t make a bear without a pattern, and whenever I did something new I felt compelled to write it down. But I finally let go of that and just created bears." Dimitri my first "Just let it go Bear" Friend Ben bear. Went to a friend who had lost a brother. About 6 years Debbie's small bears began to take on personalities when the eyes went into place, looking back at her as if to say "Hello, there!" with a big personality to match. From that time she has never looked back. 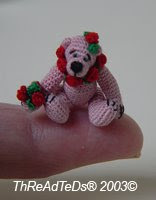 However, she is again working on new type of crochet bear design. Initial design to completion depends on how busy her 8 children are. Yes, 8, from the 2½ year old Samantha to senior year in high school oldest daughter. Debbie feels as if she's never home... always driving someone, somewhere. But 5 or 6 hours is about average for each creation - IF she had that many uninterrupted hours! 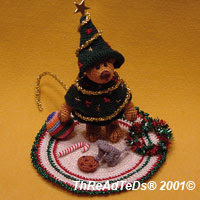 For very firmly crocheted smaller work Debbie would add on several hours. She can tell the difference between her standard work right now compared to someone like Berta's and she aspires to that level, which will come with practice. 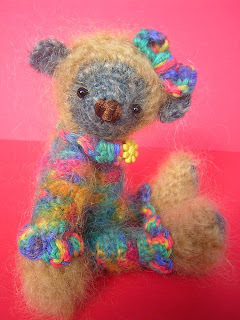 Right now she focuses on just one design or bear at a time, from start to finish, being inspired by Life around her. Sometimes newly purchased Fiber itself dictates what type of creation it should be. 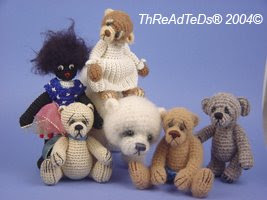 Debbie thinks of her bears as 'thoughtful, childlike, squishy'. They aren't really small nor are they large: as husband Earl calls Debbie's work “They can be seen from across the room.” We're going to take that as a very High Compliment, Earl! 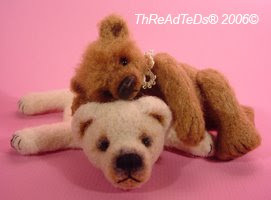 One of Debbie's most favorite bears is a bear that was destined to go to her Mom: it was put on auction for her Mom to purchase, with the monies to be donated toward the trademark issues, and in the end another bidder won Jodi. All Debbie has of her favorite bear is the image of her sweet face. As to the bear scene in general, it would be ideal if these small warm fuzzies could project their qualities onto the hearts of all of us, erasing all of our negativity. One of the many wonderful international groups and projects around the world that are attempting to do this, which Debbie supports, is Good Bears Of The World. 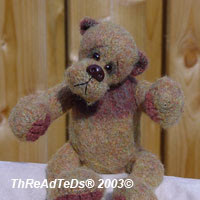 ~ I have only made one mohair bear. I would like to get better at that. and chronicles her own adventures here..
As to the bears in Debbie's Album, I'll let her add her comments on their names and how they came about. I also added notes in small type under the pictures here as well. Thanks Debbie Nicholas, for giving us all this MOST Comfortable place to gather and share our Fiber Fantasies as well as allowing us this peek into your world!!! FitzWitz, currently residing in my daughters room. She wouldn't let me sell him. Link for the Thread Animals Group.